What Makes A Perfect Vacation Rental? This week we added a spectacular new property to our list of vacation rentals. The staff of Vacation Rentals of the Desert are all pretty excited about this new addition. We especially love the properties that “sell” themselves … not because it saves us work but because we have full confidence that anyone renting the property will have a wonderful vacation … and after all that is our ultimate goal … great vacations! It is beautifully decorated and appointed. Corners were not cut in quality furnishings. Furniture is of the same style throughout the home and was not purchased at second-hand stores. 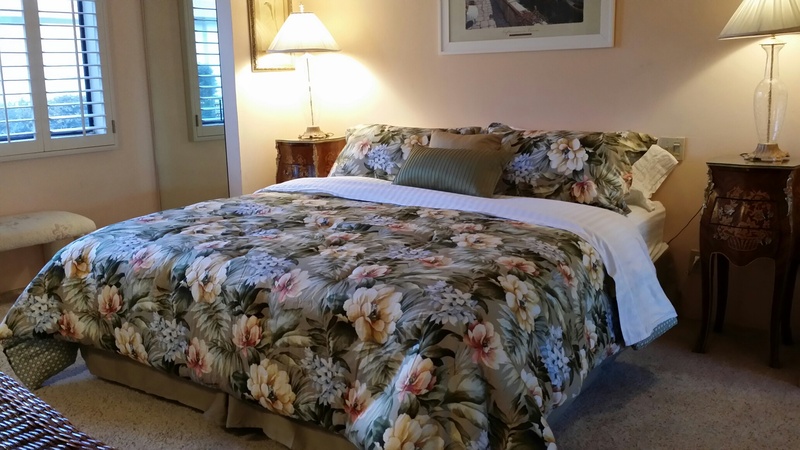 Quality linens have been furnished such as high count sheets and plush towels. The kitchen has been well supplied with great cookware and beautiful dinnerware. 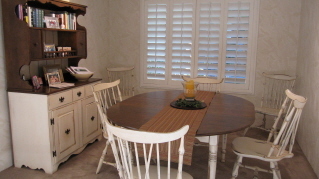 Tenants will find everything they need to cook and set a wonderful table whether a casual meal or Thanksgiving feast. The home is well maintained. There are no broken appliances or old TVs in the garage. The items that are old, worn or damaged have been tossed out. 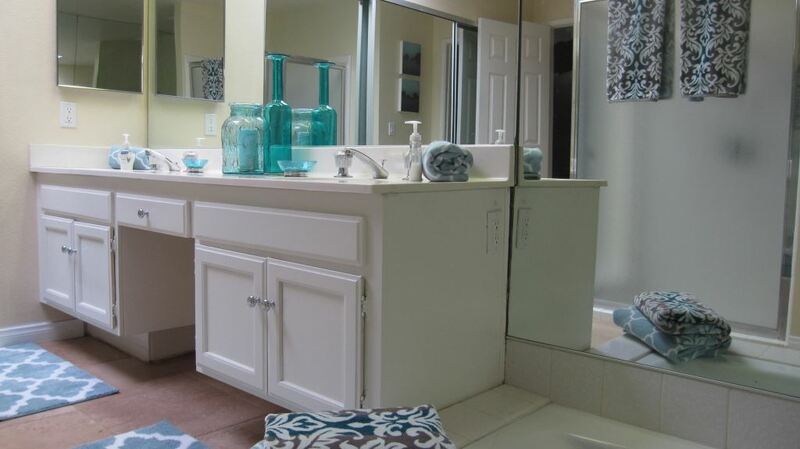 No leaky faucets no cluttered cabinets. 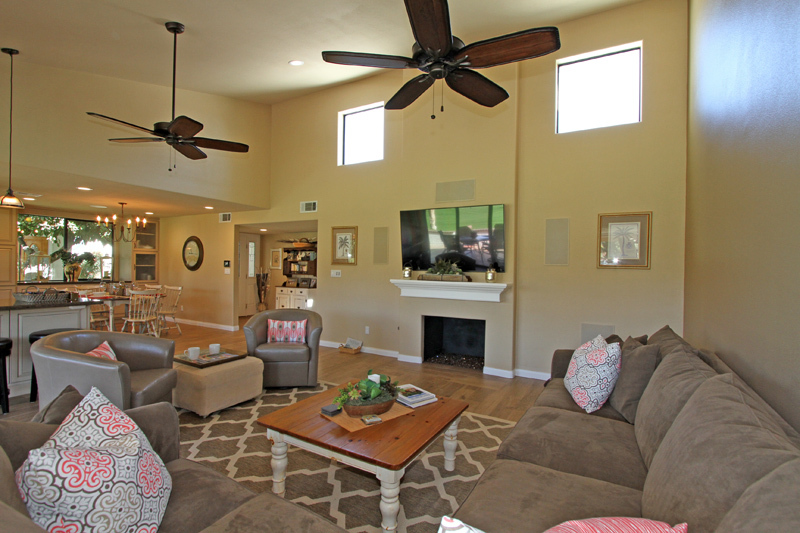 The basic standards that you will find in most vacation rentals in the desert, have been provided, such as cable TV, DVD players, Wi-Fi and land-lines with free local, US and Canada calling. 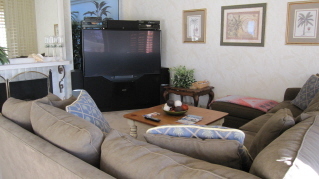 Amenities have been added such as multiple TVs, stereos, four DVD players, movies, games, books, Wii and pool toys. It has two master suites making it perfect for two couples and the third bedroom has been converted to a den that will also sleep two if needed. This makes the home more versatile. It works equally well for tenants seeking a two bedroom OR three bedroom property … with the den adding more “living” space verses a unnecessary room. 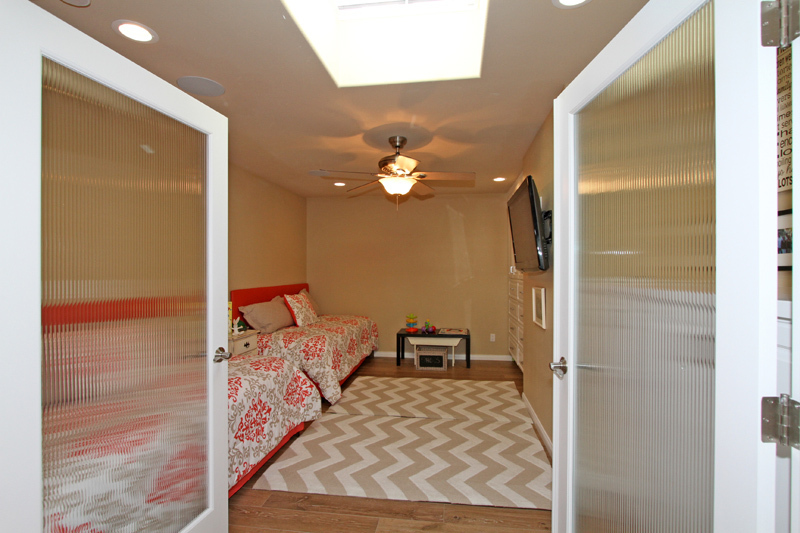 It has a dedicated office space OR a dedicated children’s room off the master. This could be a bonus for parents, grandparents OR those who need work space during their vacation. It is in a desirable gated country club. It is close to multiple pools and spas. It has a sunny exposure and panoramic mountain views. Many vacation property owners will furnish their property with their eye on excessive wear and tear … “after all it’s just a rental.” They will often go less expensive, not always because they are being “cheap,” but because they feel that items will just wear out quickly and need to be replaced. I cannot tell you how many new owners have furnished their properties with low count sheets bought at Target, thin unbreakable dishes, and 99 Cent Store mugs and utensils. Tenants recognize this right away! Unknowingly, these owners hurt themselves and may offend their paying tenants. These types of shortcuts can cost you bad reviews. If you have a vacation rental than you should treat it as “a business,” and furnish the property as you would your home. Remember … it takes money to make money … and purchases can be written off. Even if you end up purchasing new sheets, towels and dishes each year to keep your supplies “fresh,” how much are you really spending? Is it worth a one or two star review or losing a possible repeat tenant? You must always keep the comfort of your guests in mind when furnishing and supplying your property. Spending a bit more to supply your vacation home with quality makes just makes sense. Items will last longer, guests will appreciate your home and care for it better, reviews will be better and tenants may return again and again. The property I’m featuring today is owned by a family that loves visiting their property and entertaining family. They enjoy sharing it with vacationing guests and realize that the same mishaps that happen in any home, are bound to happen from time to time. The owners do not cut corners that effect their personal enjoyment of the property just because it is also a vacation rental. This is a great mindset and a win/win for owner, vacationing guests and us as the rental company. So take a look at this really amazing vacation home … and give us a call if you want to try it out. It won’t last long! 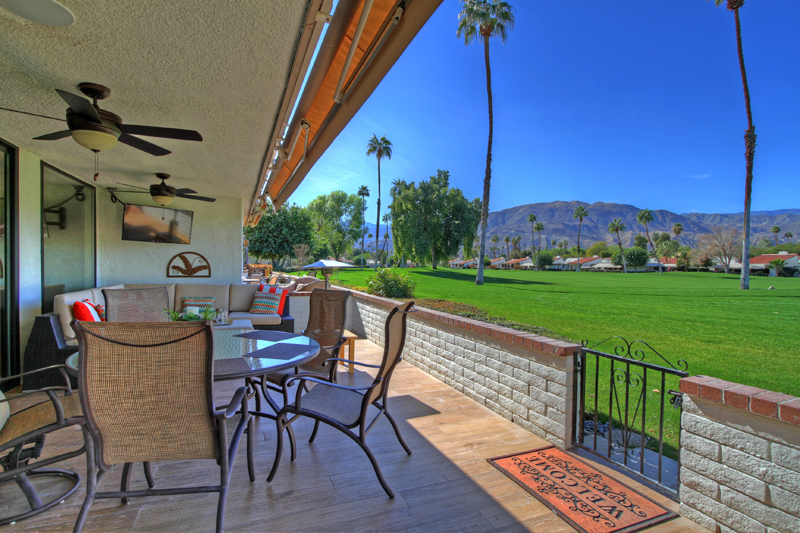 Breathtaking Mountain Views Overlooking a Sparkling Lake and Double fairway! 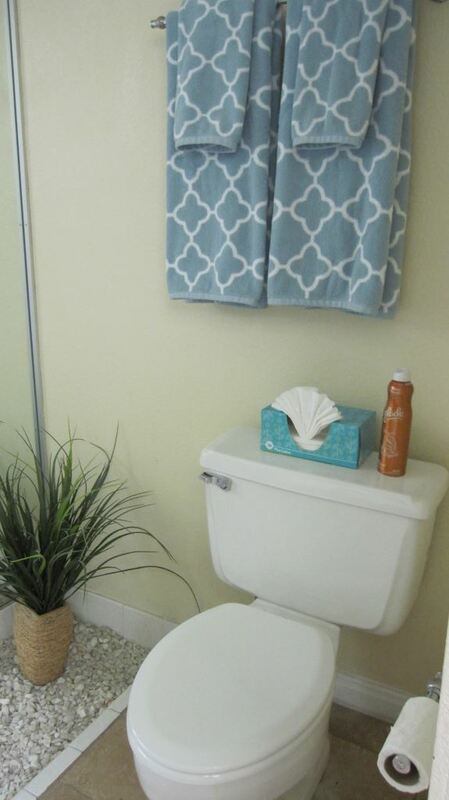 Give your bathroom the “spa look” with quick, easy and inexpensive decor updates. The past few weeks I have been posting ideas for updating and dressing up a tired vacation rental property … my summer project. It is surprising how small, inexpensive updates, in just the right areas, can greatly enhance your vacation rental business … and again, I cannot stress this enough … if you are a vacation rental owner … you are in business! You know the old saying, “it takes money to make money.” This is oh so true in vacation rentals. A photo of outdated furnishings and décor on your vacation rental listing can turn away business. Old silk plants, and especially those dated silk flowers, dated bedding and towels … all these things show up in photos and make a property look old and uncared-for. Always assume that your potential renters live in a nice updated home, that they see the latest trends and décor in stores and magazines. Why would they select a dated property for their vacation? The vacation rental business is booming and with the recent growth, there are plenty of properties out there decked out with all the “latest and greatest.” Back when the availability of vacation rental homes was limited …. guests were happy finding anything. That has changed dramatically in the past five years. Now guests can be choosy and sometimes, demanding. We’re in their world now and as any smart business owner knows, you have to find a way to keep their “customers” coming back and attract new ones. What you are selling cannot just be available …. it must be desirable too … and better then the rental next door. So your friends and family say they LOVE your property. If you allow your friends and family to stay at your property free or at a small cost, OF COURSE THEY LOVE YOUR PROPERTY!! If they say otherwise, your feelings may be hurt and you may not invite them back. You must look at your property through impartial eyes. I have to do this every day. It is difficult, but it is in the owner’s best interest that I am honest … kind, but honest. So today let’s talk about bathrooms. It is surprising how a few simple updates, at little cost, can go such a long way. When your prospective guests scroll through your property photos, instead of whizzing through the bathroom pictures, they may even just take a second look. 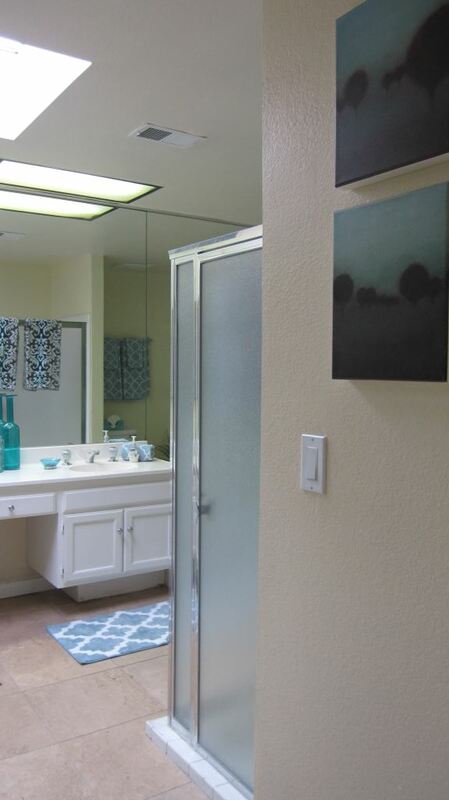 TIP: In bedrooms and bathrooms … the “spa” look and feel is what sells. 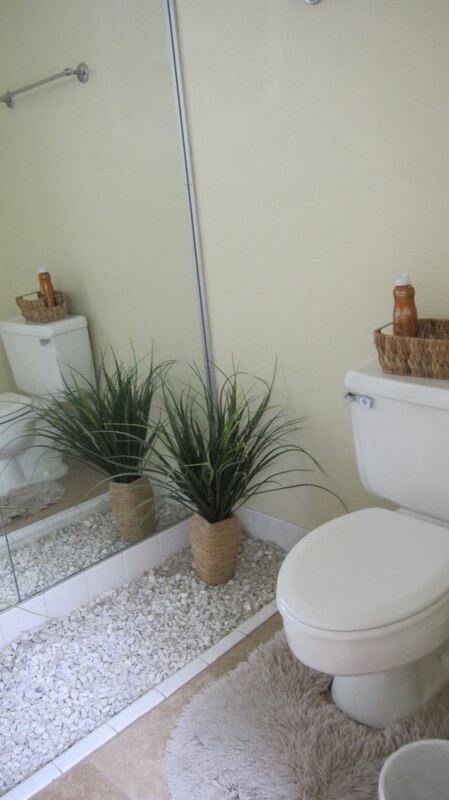 Below is the master bathroom at the vacation home I am currently updating. 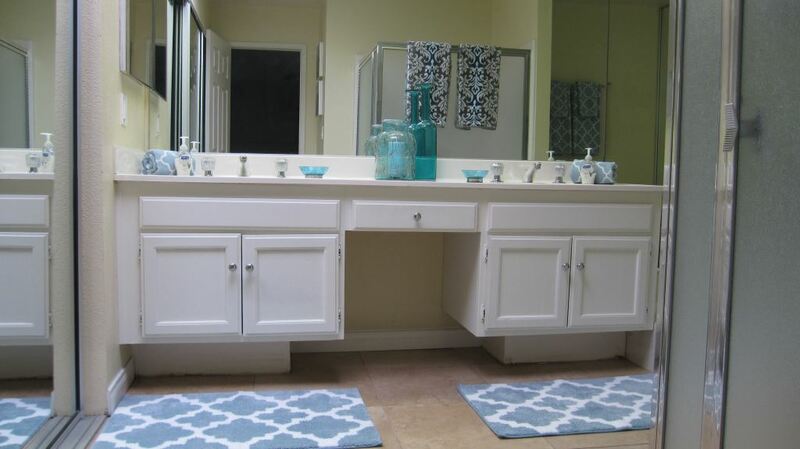 The home owner suggested a blue palate, and I ran with it, adding color with countertop décor and eye-popping towels, to transform this nondescript and sparsely decorated, white and tan master bath to an updated spa like retreat. This full transformation came in under $200 …. thanks to HomeGoods! Well I’ve almost completed my summer project … sprucing up a tired vacation rental property. Trying to fit this, so far, three week project into my busy work schedule has become a true labor of love but the condo is looking spectacular and I firmly believe that it has not only been time well spent, but also that the owner’s costs will be more than covered with added bookings. My staff has a new and improved level of confidence in recommending the property to prospective tenants and they love the updates … which in turn creates an excitement about the property and generates more rentals. A win – win situation for everyone! Today we’ll talk about kitchen supplies. If food is the key to a man’s heart … a well-supplied kitchen is the key to a cook’s heart. 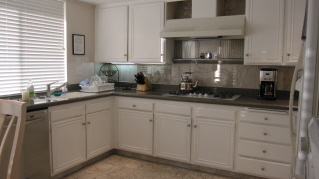 A well supplied kitchen is crucial for renters that book for extended stays and large family gatherings. 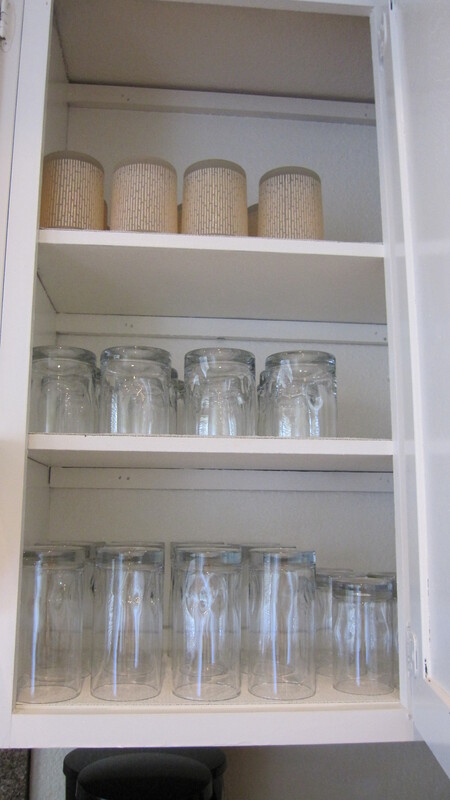 You should inventory your kitchen often and with a critical eye. 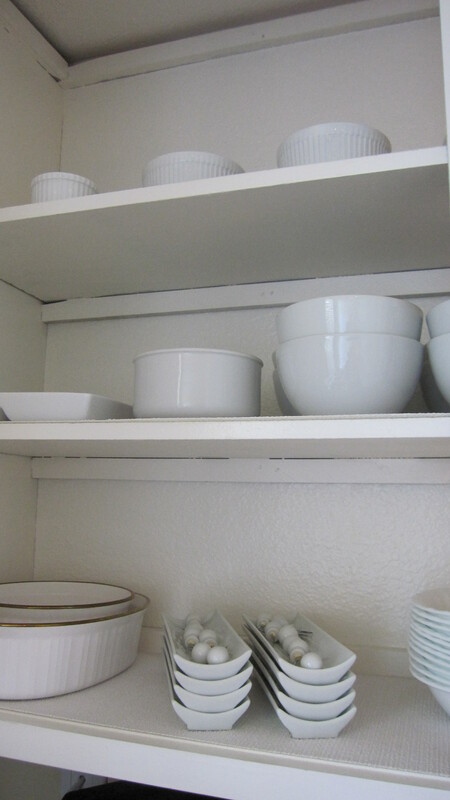 The last thing you want is for your tenant to open a kitchen cabinet and find chipped or miss-matched dinnerware. Same for silverware, glasses and cookware. Everyone has that favorite plastic spatula or cooking spoon, discolored from the dishwasher or burned from cooking. That’s OK when it’s “your” utensil … you know that it’s clean … just well-used. Or that beloved novelty coffee mug that you picked up on vacation … stained with coffee, but your go-to when visiting your vacation home. These items are fine at your own home but to a guest … absolutely gross! You must approach your kitchen with a guest’s eye … if the item is questionable in your mind … toss it. And I mean toss it! Don’t make the mistake of leaving it there “just in case” the guest doesn’t mind … believe me someone will and it will only lead them towards questioning …everything. The other thing it will do is take up space and add useless clutter. 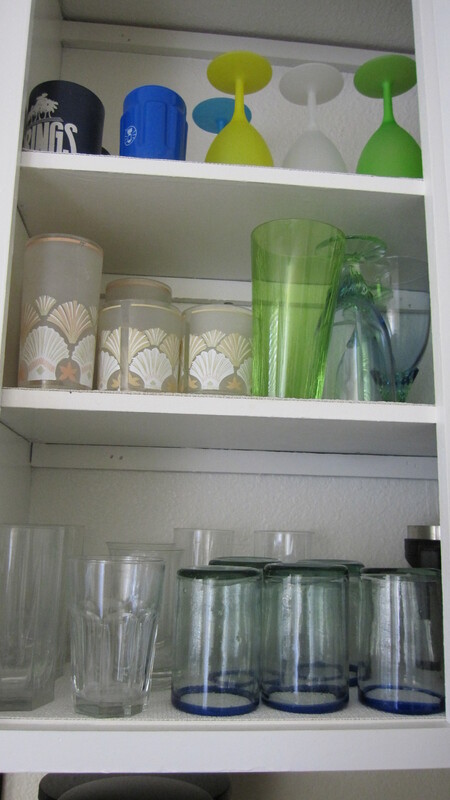 If you buy new dishes or glasses, toss the old ones. If you don’t, pretty soon you will have a hodge-podge of kitchen supplies and incomplete, miss-matched kitchen furnishings that will eventually cost you in bad reviews. Below are this week’s before and after pictures. These updates cost the owner $220; purchased from HomeGoods and Target was a complete eight place setting of dinnerware (dinner plates, salad plates, bowls and coffee mugs), twelve place setting of Oneida silverware plus service pieces and steak knives, twelve drinking, highball and juice glasses, all new utensils, measuring spoons and cups. The difference it made to the kitchen … HUGE. I tossed all the old glasses and novelty coffee mugs and all the old utensils. The owner had a set of unbreakable Corelle dinnerware which is perfect for every day use but paper thin and not suitable for entertaining. I kept the Corelle dinnerware and added the white porcelain place setting for eight … for a whopping $40!! The utensils were badly worn, and even though there were at least three dozen glasses … no four matched … so I tossed them all. I also tossed out three old coffee carafes that did not match the existing coffee maker, at least two dozen rusted miss-matched steak knives, six stained storage containers and three aluminum pie tins saved from frozen pies. 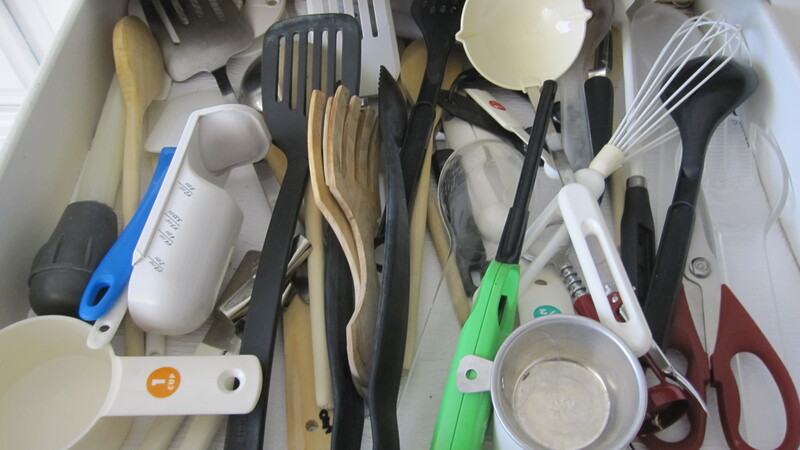 Many owners and guests just hate to throw things away, but in a vacation rental you have to clean out and replace kitchen supplies on a regular basis. 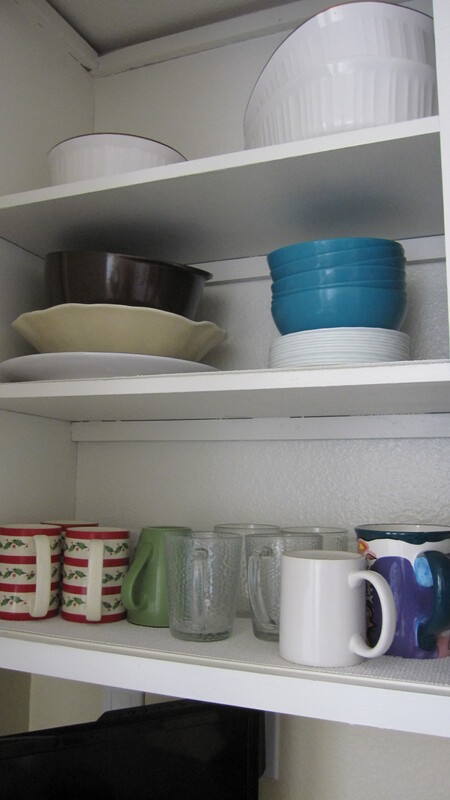 BEFORE … Miss-matched dishes and mugs. BEFORE … Corelle dinnerware and misc. tea cups. 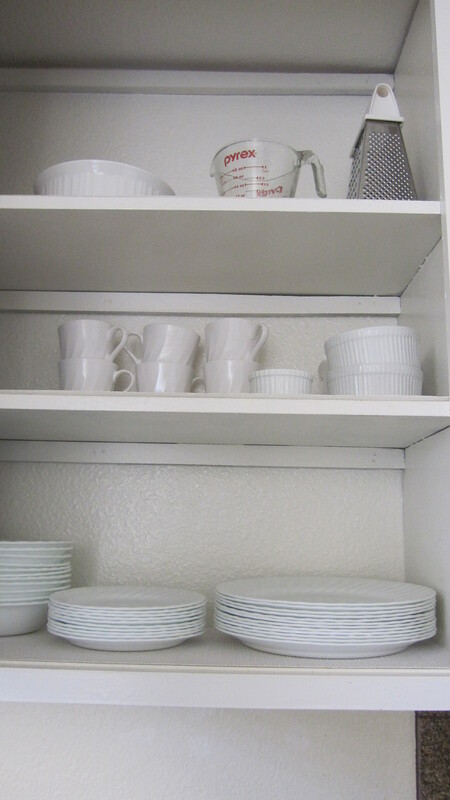 AFTER … All white, matching and organized serving ware. 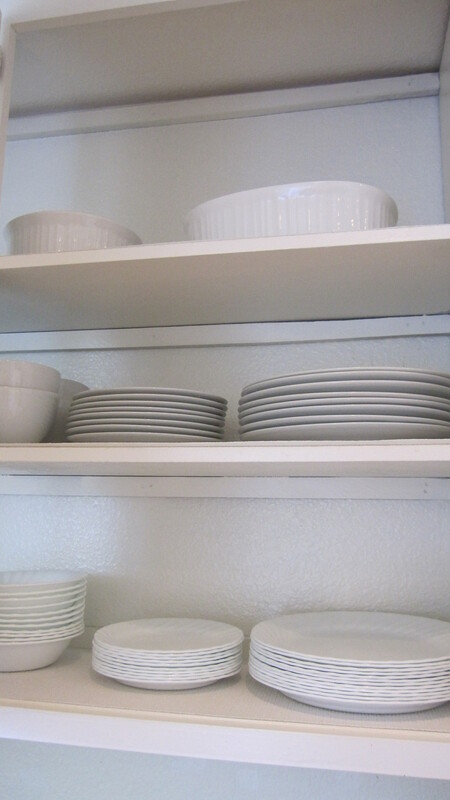 AFTER … We kept the Corelle dinnerware for casual use and added white porcelain dinnerware for entertaining. BEFORE … Misc. glasses, novelty mugs and serving ware. AFTER … Matching glasses in sets of twelve. 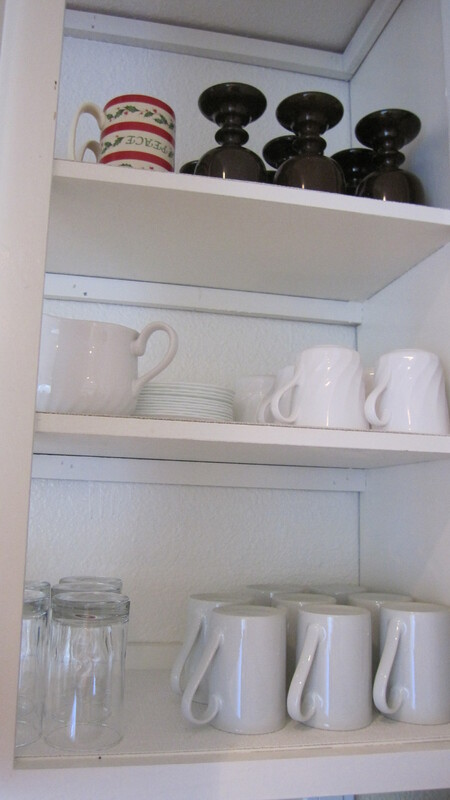 AFTER … Matching coffee mugs, tea cups and dessert dishes neatly organized. BEFORE … Three different sets of silverware, none complete. Miss-matched steak knives and worn novelty knives. BEFORE … Worn and dated utensils. I tossed everything except the scissors, salad forks and peelers. 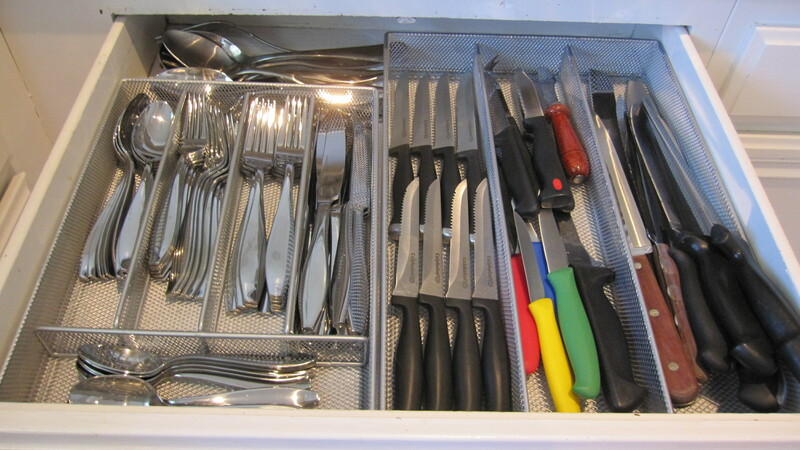 AFTER … New silverware and steak knives. I tossed the old and worn knives. 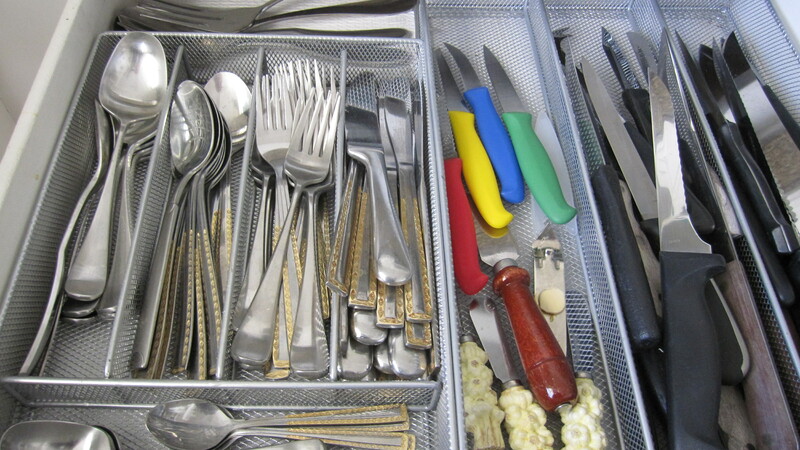 This is how a well organized silverware drawer should look. AFTER … New, quality utensils. I recommend stainless which will last longer, but some plastic is needed for non-stick cookware. Awww … the quite time of the year! Afternoon siestas, no phones, no emails, lots of time off work. Ha! Fat chance! We’re busy bees getting ready for next season, making reservations, marketing for new properties, cleaning up files … and this is the time of the year when many owners ask for my assistance in “dolling up” their property, coordinating renovations and repairs, purchasing replacement supplies, etcetera, etcetera, etcetera. Any improvement on a property we list is beneficial to my company too. Enhancing a property only makes it that much more desirable to a potential renter and easier for us to promote. This week I started a new “facelift” project on a property that has been with our company for years. The owner and I were discussing ways to generate more income on her vacation rental condo and I suggested a few areas that needed to be updated and improved. Based on this project, over the next few weeks, I will show you how you can spend a little money and make big “eye catching” improvements that will generate more interest in your vacation rental home. 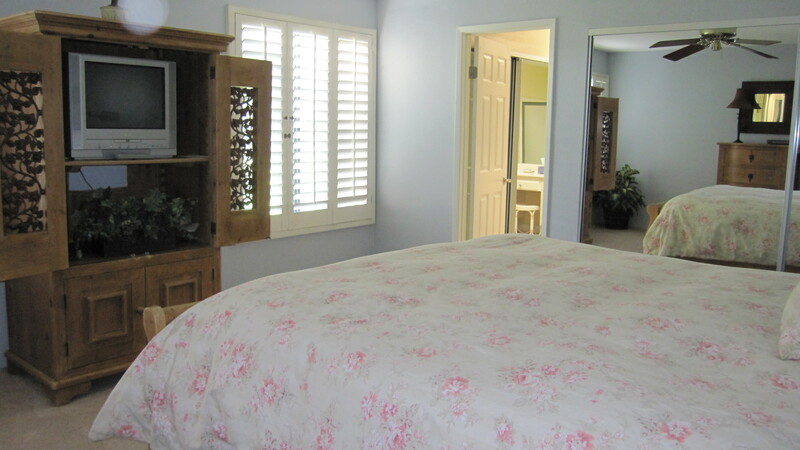 The first set of pictures below, are the “before” shots of the master bedroom that were posted on the Vacation Rentals of the Desert website. The bedroom walls are painted a soft blue-grey, so this was our base color. As you can see, the duvet is a light color, is boring and looks rather drab. The TV is old which guests interpret as the owner being cheap … and may also make them wonder about the rest of the property and what other corners may have been cut. So we purchased a bright new duvet cover and euro shams from The Pottery Barn with just a touch of blue in the pattern. The bright colors and bold print updates the bedroom and adds excitement to the décor … now the photos “POP.” When we put on the new duvet we found that the sides were just short of covering the box springs and with the wood frame surrounding the sides of the bed, a bed skirt was not an option. See “after” photos below. Tip: To address this problem we took an extra white fitted sheet and put it on the box springs. If you use the same color sheets to make your bed you will never notice if the box springs are showing. When I approached the owner about replacing the TV, she explained that she was limited to the size of the existing entertainment armoire and thought that a new flat-screen would have to be fairly small to fit the space. So I measured the width, 32 ½ and actually found a 32 inch TV which is the recommended size for a standard bedroom. Tip: The size of a TV screen differs from the width of the TV. The TV screen is measured diagonally, from top corner to opposite bottom corner. The 32 inch TV was actually only 29 inches wide including the frame of the TV. I may have been able to get a slightly larger screen but I found a great sale at Best Buy and was able to get a 1080p TV for $199. Tip: Replace all older TVs with new flat screens … they are inexpensive and quickly pay for themselves with bookings and happy tenants! We also found a great bedroom chair at a consignment shop and purchased it for $80 which filled an empty space in the room and created a cozy reading area with lots of natural light. We’re still looking for the perfect standing lamp to go behind the chair … otherwise the room is complete. We went through all the bedding. This condo has a California king in the master, two full size beds in the guest bedroom and a queen size sofa bed in the den. To make it easier to identify damaged sheets, it is best to have only two sets of sheets per bed. Typically cleaners will immediately strip used beds and throw the sheets in the washer. Then they remake the bed with clean sheets from the linen closet. If you only have two sets per bed, cleaners can easily spot damage and stains when making the bed up or when folding the laundered sheets. If you wish to deduct damage from tenant deposits or have insurance coverage on these items, finding damage on a timely basis and identifying the source are very important. If you have ten sets of sheets … it is likely that some are miss-matched and some are damaged. Tenants who find a “bad” sheet will usually fold it back up and put it back in the linen closet and it will eventually be pulled out by another tenant. When found by a tenant, often the result is a bad review on the condition of the property. Tip: Just keep it simple. With only two sheet sets per bed, the linen closet will look much neater and you’ll be able to identify damaged bedding before the next tenant arrives. If you have several sets of good sheets, lock them up in your owner’s closet to use them as replacements in the future. We tossed the two king size pillows since they were stained … no pillow protectors … and purchased four new king size pillows and four protectors. 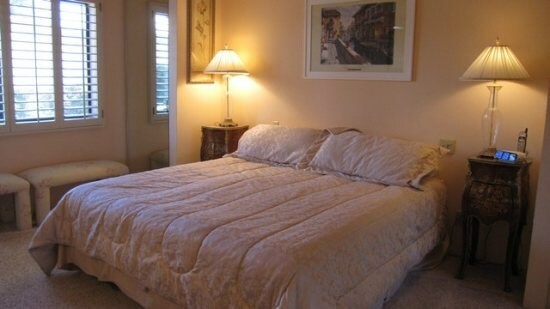 I always recommend four pillows on king and queen beds to give a luxurious spa look and feel to a bedroom. Tip … choose pillows of various firmness so all tenants will be sure to find one that fits their taste. Tip … if you are buying new sheets for multiple beds, I suggest you purchase only one color for each size of bed … it will make it easier to identify the size of sheets you are looking for in the linen closet. 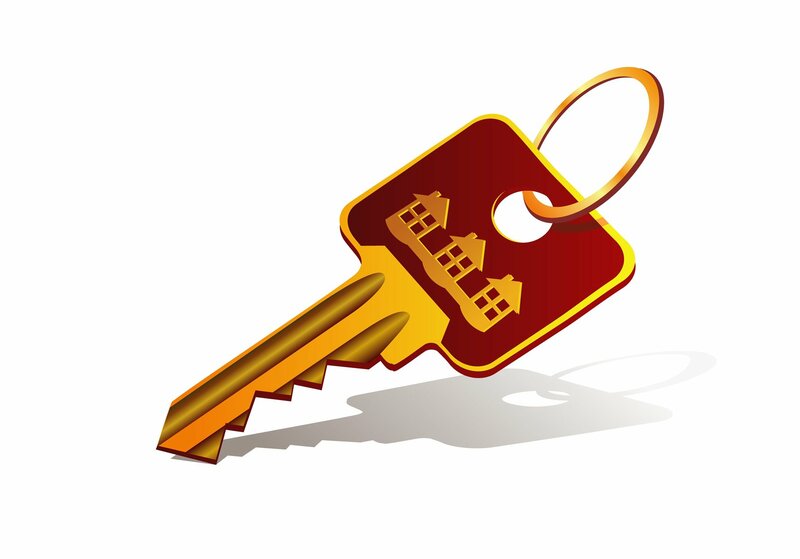 We have one property on our rental program that has a California king in one bedroom and an Eastern king in another. It is a nightmare for anyone to find the right size of sheets from a linen closet full of all white sheets in various sizes. Labeling shelves does not work. Some tenants and cleaners will stack clean sheets anywhere and disregard the labels. For example you could purchase all white sheets for the Cal king, all ivory sheets for the Eastern king, tan for the queen, etc. or whatever colors match the rest of your bedding. Then tape an index card inside the linen cabinet door noting which color of sheets and bed size corresponds. Trust me … your guests and cleaners will love you. Shop consignment stores! A few vintage pieces can add charm and interest to your decor … but be careful not to go overboard creating a “dated” look to your vacation home. So … you just purchased a vacation rental home. If the property is unfurnished, you have a blank slate and the perfect opportunity to choose furnishings and amenities that will draw tenants. If you plan on using the property yourself, of course you will want to furnish the property to meet your needs, but it is also important to consider the needs of prospective tenants. Through my years in the vacation rental business, I have seen gorgeous properties sit vacant while a lower-end property next door was constantly rented. There are more factors in making your property desirable then decorator décor. Location, pricing, bed configuration and amenities, weigh heavily in attracting inquiries. I have a few suggestions for those new to vacation rental ownership and suggestions for areas that are often overlooked. First … It is very important that you read through the city’s vacation rental ordinance. Even if you plan to have a professional management company handle your vacation home, you as the property owner, are fully responsible for any ordinance violations. Most cities have short term vacation rental regulations that limit the number of occupants based on the number of bedrooms. It is important that you know what the city considers a bedroom or sleeping area. There is no use adding sofa-beds in living rooms and dens if the city sets occupancy limits. For example, here in California, a room without a closet is not considered a bedroom. So if one of the bedrooms has been converted to a den and the closet has been removed, it is not a bedroom. If your plans are to use the space as a bedroom or sleeping den, to be on the safe side, you may want to consider adding a closet. Ordinance violation fines for exceeding occupancy limits can be significant. I would ALWAYS advise a king in the master bedroom! This is a big deal breaker for many people. 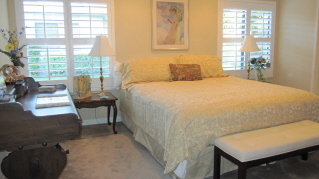 Two reasons: If the tenant has a king bed at their own home, they will want a king bed in their vacation home too. If the tenant is tall, they will need a king bed to be comfortable. 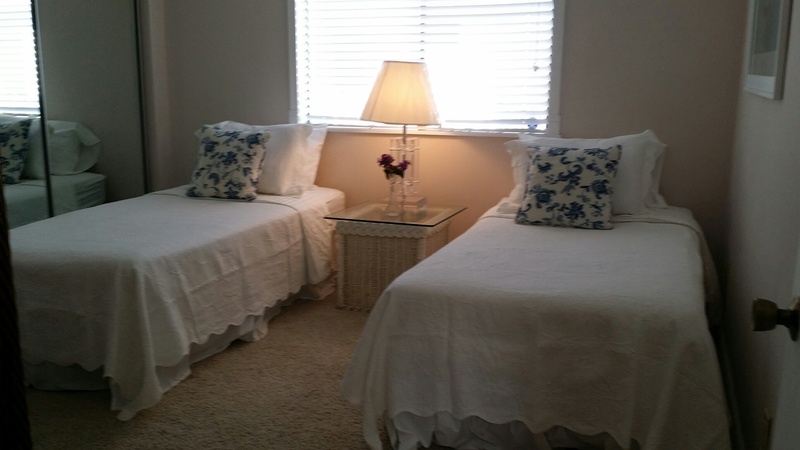 Vacation Rentals of the Desert manages several vacation homes with queen beds in the master … and believe me … this IS a big deal and we see a significant difference in desirability. Did you know that two twins can easily be joined to make a king? When advertising, you should always describe the beds as “two twins that can be converted to a king.” Twins-to-king conversion kits can be purchased at Bed, Bath & Beyond or online at Amazon. There are increased costs but it will also make your property suitable to a wider audience. 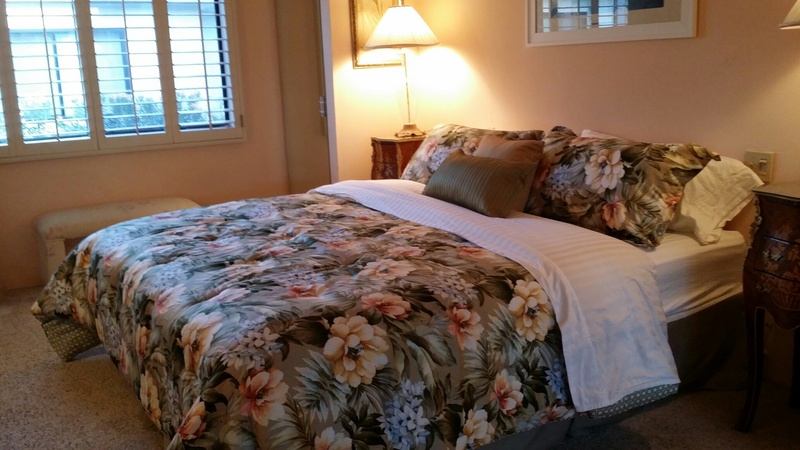 You will need complete bedding for both twin beds and a king bed … mattress pads, sheets, blankets, bedspreads. 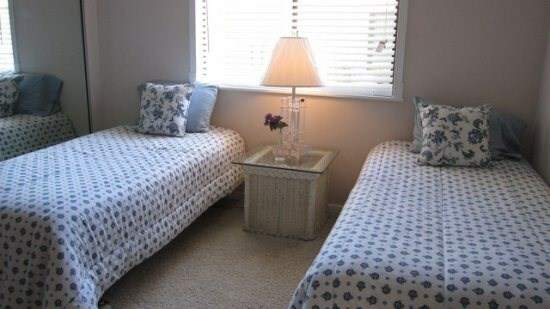 You will also need to ask tenants how they would like the beds set up for their stay. Note: If you are with a management company or are a long distance owner, you will probably have to pay extra for the beds to be joined or parted and then for the beds to be made up with the correct bedding. Another note: I would never cut corners and push two twins together and advertise it as a king bed. It is likely that the tenant will feel the hump in the middle and you will probably get a complaint call or worse … a review saying that the bed configuration was falsely advertised. Full disclosure is your best bet. 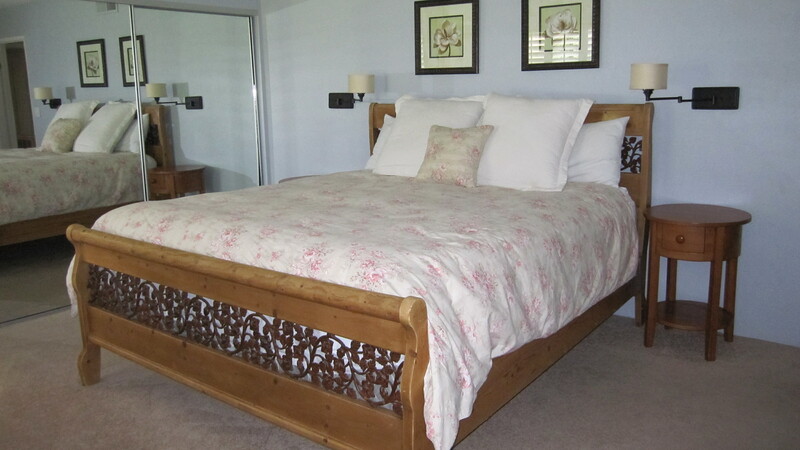 If you have a large guest bedroom you may want to consider two full or queen beds. This is much more appealing to a renter than two twin beds. A single full size bed should only be used if you do not have room for a larger bed. It will not be appealing to a couple. 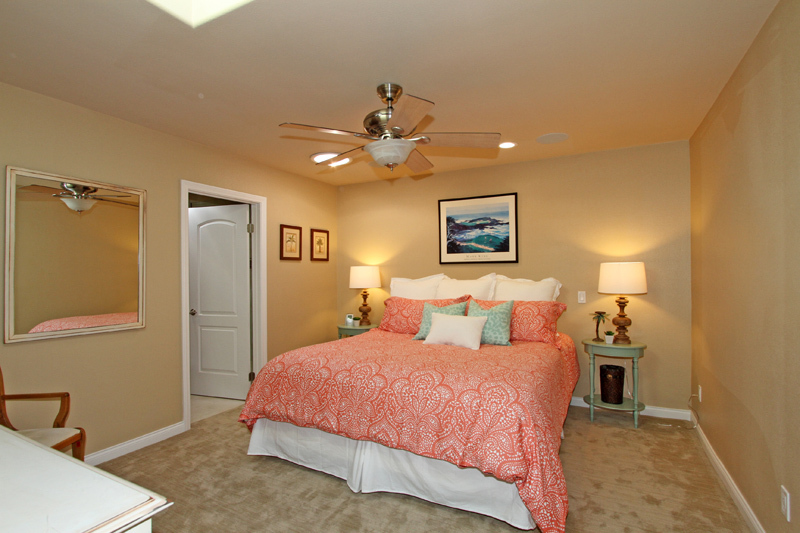 If at all possible you want each bedroom to have the ability to sleep two people comfortably. I am not a huge fan of bunk beds. Couple of reasons: First … safety and owner’s liability are big concerns. Second … it pretty much limits the room to children only. Adults will shy away from even sleeping in the lower bunk. However, in some communities bunk beds may be a plus. Before buying I recommend that you check with your insurance company on possible liability issues. Sofa-beds are rarely comfortable but adding a very thick, quality mattress cover will help greatly. Sofa-beds are best used by children or for short stays. If your demographic caters to adults, beds are preferred. 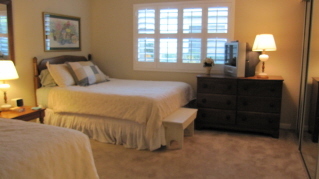 We have several three bedroom condominiums where one bedroom has been “purposed” as a den/office. For our demographic, this makes sense. As I mentioned, most of our tenants consist of one or two couples staying for one month or longer. They may think that a three bedroom property is unnecessary and will not even consider it … but a two bedroom with an office/den is a space that they will use. It will also work for families that come out for shorter stays where a sofa-bed can be used for a few days or by a child. If you know what the typical renter in your area is looking for in a vacation rental, you will be able to better determine how to furnish your vacation home to attract attention. A small desk tucked into a corner creates a handy work station for your guests. Look for a desk that compliments your decor and avoid student computer work stations. Desk or Office Space: Have you ever stayed in a hotel that does not have a desk? Now more than ever, a desk is a welcome amenity. You can bet your tenants are bringing their laptops, iPads and Notebooks. From correspondence, to bill paying, to keeping up with the stock market and even those who are on a “working vacation,” having space to set up their computer is huge. Unless your property is advertised as a bare-bone; wilderness experience … you absolutely MUST have Wi-Fi. Note: Choose a nice home/office desk that will match your décor, such as the one pictured here. Avoid the inexpensive student style computer desks that will conflict with the beauty of your home. Living Room Furniture: Rule of thumb … at least enough comfortable seating for the maximum amount of tenants who will be staying at the vacation home. If you have a three bedroom home that sleeps six, then you want seating for six … and that doesn’t mean wedging four people on a sofa. Imagine three couples watching TV. They will not be comfortable on top of each other. Same goes for the dining room and patio furniture. You should have seating for the maximum number of people your property will accommodate. Flat Screen TVs: If you have an old boxy TV … throw it away. Even if it works … throw it away. It will lose you rentals … guaranteed. When a tenant sees an old TV they immediately think that the owner is cheap and does not keep up the property. We hear this every day! It may be the farthest thing from the truth, but that is how a prospective tenant will perceive it. 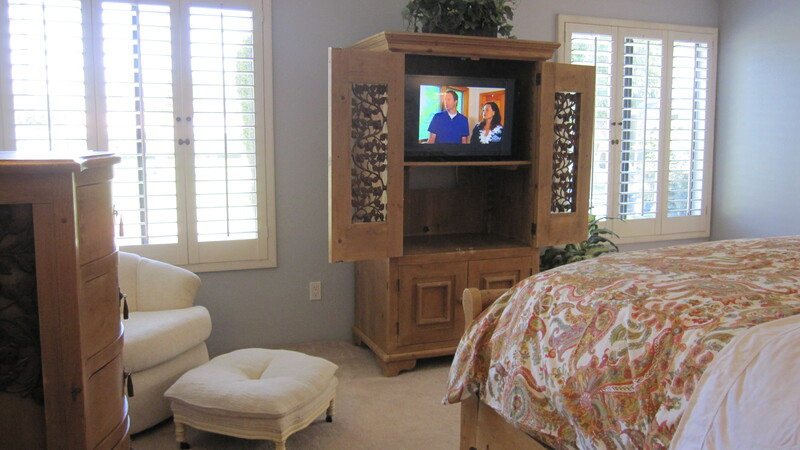 A flat screen TV in the living room, den and all bedrooms should cover all the bases. You will never lose renters because you have too many TVs … but you will for not enough. If they have children, bedroom TVs can be a big deal. With the cost of TVs these days, it is an investment that will pay for itself quickly. Best Buy typically has adequate 32” TVs for less than $200. DVD or Blu Ray Player: I recommend Blu Ray players. They are now inexpensive ($10 more than DVD), and they will play regular and Blu Ray discs. This past year I went with two long time girl friends on a three day vacation to the mountains. We had planned one stay-home evening of wine and chick-flicks. We were really disappointed that there was no DVD player of any kind at the vacation home. This isn’t even considered an amenity anymore … it’s a necessity in a vacation home. Lighting: I know … I love those little decorator bedside lamps with the dark colored shades that match the bedspread … but can you read a book in bed? Look for those really great bedside lamps that you CAN ready by … maybe the kind that uses three-way bulbs. Recessed lights in the ceiling are great for lighting an entire room but not so great for reading. You should have table lamps in the bedrooms and in the living room. Furnish your vacation home so that every tenant can read in bed or in living areas and you’ll never get a complaint about lighting. If you do not have the space for a table to place a lamp, I recommend one of the standing lamps with three directional lights. It can be stored in a closet, but easily moved by tenants wherever needed. Ceiling fans in living areas and bedrooms will help to cut your air conditioning bills and add beauty to your vacation home. Ceiling Fans: EVERYWHERE if you can. It’s not a necessity, but will make a huge difference in your air conditioning bills. Full Length Mirror: Somewhere in the property you should have at least one full length mirror. Door Hooks: I cannot tell you how many owners do not think to put hooks behind bathroom doors. Tenants often mention the lack of hooks to hang their robes or sleepwear. Or worse … owners will return to their properties to find that tenants have taken it upon themselves to put up a stick-on type hook … which the owner may not be unhappy about. It is always best to put up the hooks that you desire and that will match your décor. Area, Bath and Kitchen Rugs: Always purchase non-skid rugs for safety purposes. If you have tile inside the front door, back door or sliding glass doors, you should have a non-skid rug to prevent slipping accidents when the guests enter when raining or wet outside. I usually recommend machine washable rugs whenever possible. This will save you a little money in professional carpet cleaning costs. Throws: If you decide to purchase throw blankets … I recommend the kind that can be thrown in the washer. They will need to be cleaned. This season we had mishaps at two properties where tenants washed wool throws, not noticing the dry clean only label. The owners now have very expensive kitchen hot pads! For more ideas and helpful hints, read through some of my earlier blog posts. The posts that address furnishings in particular are, “Dress for Success,” posted February 8, 2015, “Make Cents?” posted June 22, 2014, “Furnishing Tips … What You Don’t Know May Cost You,” posted February 23, 2014 and “Kitchen Rehab,” posted February 2, 2014. A complete copy of Vacation Rentals of the Desert’s Minimum Requirement List, which may be helpful when purchasing your basic needs, can be found in my December 14, 2014 post titled “A Perfectly Appointed Vacation Home.” Of course you may have additional needs based on your area and demographic, but our list may be a good starting point. As always, I would be happy to answer any of your questions asked through this blog or at Vickie@vacationrentalsofthedesert.com. Happy Sunday! Property goes from $1,850 to $3,800 per week! I’m excited to share one of our latest make-over properties. We have managed this condominium in Rancho Las Palmas for many years, and after an extensive renovation and remodel, this home has gone from $1,850 per week to a whopping $3,800 per week. If I’m not mistaken, it is the highest end property in Rancho Las Palmas Country Club and Vacation Rentals of the Desert is proud to be handling this spectacular home. Since completion and it’s relaunch on our listings, it has successfully been generating bookings. It’s amazing to look at the before and after pictures side-by-side … or in this case, one-atop-the other. This was a lovely home before the updates, but now it is over-the-top! What began as a three bedroom, two bath home with a traditional floor plan has been transformed into a four bedroom, three bath, plus powder room, vacation home with an open floor plan. Click on the picture above to go directly to the property listing. In the description you will see all the added amenities that are not always found in a vacation rental … such as the state of the art electronics and piped in music in every room. You will also note the difference between amateur and professional photos. They can make all the difference in the world. Before … a cozy, comfortable living room. Before … traditional dining room. 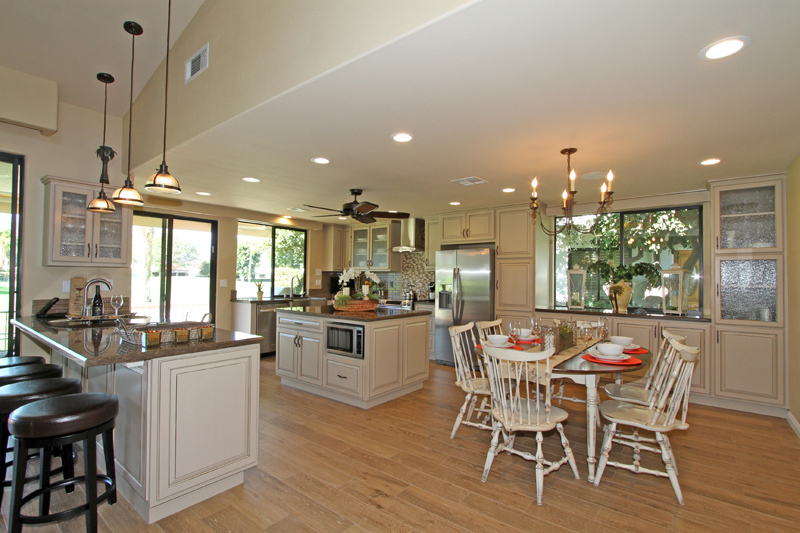 After … large open area dining and kitchen bar added with additional seating. Before … original cabinets in a separated kitchen. 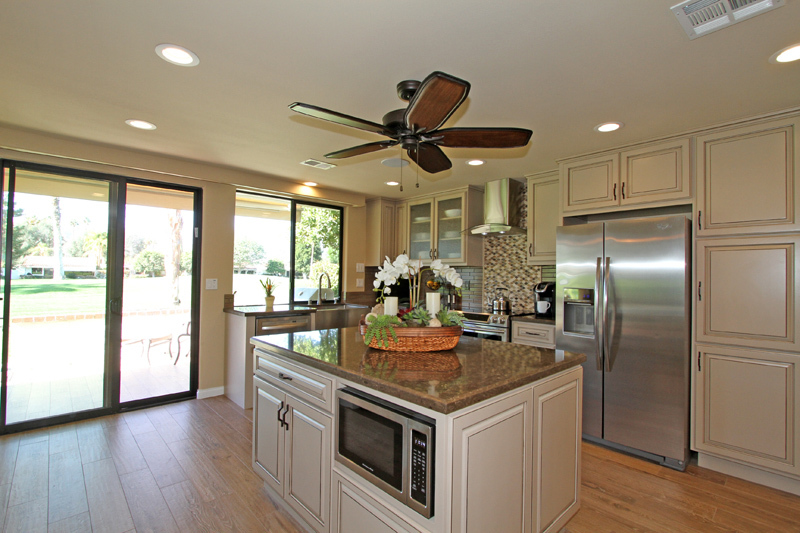 After … an open kitchen with premium appliances, custom cabinets and windows and is a chef’s dream. Before … the enclosed atrium gave window and light access to the interior bedroom but was not a true living space. After … the atrium has been converted to a children’s room with two trundle beds which make into three X-long twin beds, mounted TV and skylights. Now a much used space. Before … the master suite was lovely but ready for an update. 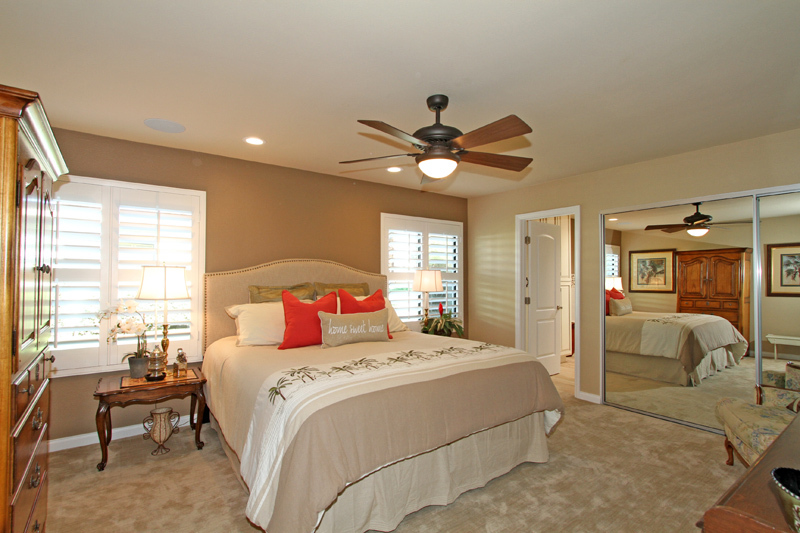 After … the updated master suite is new, fresh and spa-like. Before … the original bathroom from the late 70s. 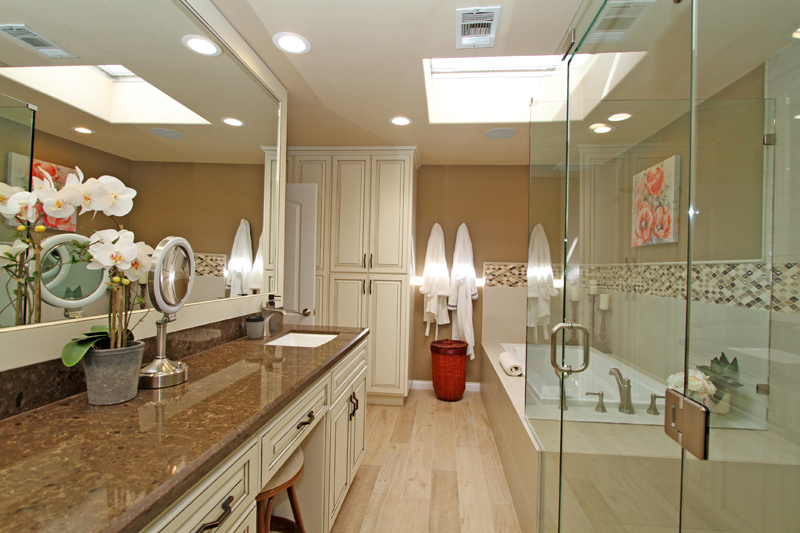 After … This master bath is AMAZING. 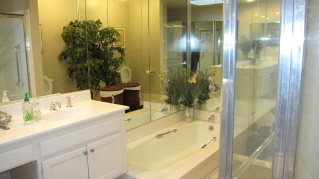 Very spa-like with soaking tub, spacious walk-in shower, his and hers sinks, seated vanity and heated floors! Before … queen bedroom just off atrium. 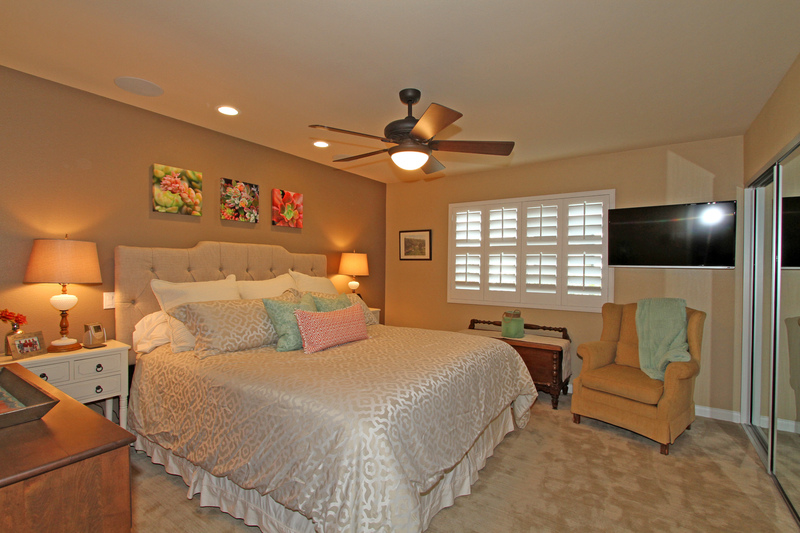 After … updated and now a private king guest room with skylights. A private en-suite with walk-in shower has been added. Before … guest bedroom with two queen beds and direct access to hall way bath. After … now a king size bedroom with private en-suite and walk-in shower. Before … our lovely Trish from the office, models the expanded back patio. After … updated and newly furnished with a patio seating area, dining area, TV and a large stainless BBQ (not pictured). Every week for over a year now, I have sat down on Sunday morning to write a story for this blog. Most weeks I have a topic in mind, however sometimes the events of the past week will force themselves to the forefront of my thinking … which brings me to this week’s topic. Vacation Rentals of the Desert has a very unique non-exclusive management agreement with many of our home owners. We developed this idea during the recession to allow vacation property owners the opportunity to off-set their management costs by participating in the rental process … to a degree. I have found that this system has worked well for our company and have a handful of properties with owner booked tenants as well as tenants acquired through our company. The property that I will describe in today’s post is a gorgeous, newly remodeled and furnished condominium that joined Vacation Rentals of the Desert this past summer. The new owners, when purchasing the condo, agreed to honor a three month booking from the sellers. As new owners to our vacation rental program, we provided a minimum requirement list and after viewing the mid-century decorated property with the owner, I made several recommendations towards improving its functionality as a vacation home. One of the first things that I noticed was the lack of window coverings. In the main living and dining areas there are large sliding glass doors that look out onto a patio and the fairway beyond offering a gorgeous unobstructed view to the outside world … and an equally unobstructed view of the inside and its inhabitants! It was easy to identify a privacy issue. The decorator faux drapes framing the sides of the windows were removed and motorized blinds installed. Problem solved. Recessed canned lights are fitted throughout the condo adding to the clean modern feel, but the lack of lamps present a problem for guests trying to read, or when one person is reading and another is watching TV. This was easily addressed by purchasing a couple of standing lamps with directional lights. These lamps are a favorite trick of mine and I believe should be standard in every vacation rental home. They can be easily moved to wherever needed and then stored away in a closet when not in use. Another area of concern was the beds … specifically the height of the beds. Personally I do not remember beds in the 50s and 60s being so low to the ground. Lower than today, for sure … but mattresses on the ground were pictured with peace-sign bedspreads and shown in hippie pads, not as a “decorator” detail. True mid-century modern would be a full size bed in the master bedroom with short legs screwed directly into the box springs. Anyone remember those? But I don’t see that going over well today. Despite the beds being so low, and based on the fact that the condo had been a rental the previous season, the owner and I decided to take a “wait and see” approach for the time being. Their tenants arrived and settled in. Typically we do not become deeply involved in an owner acquired guest, but we are always happy to assist if needed. It wasn’t long before we realized we should have been pro-active regarding the beds. One visit with the guests showed that height was not the only issue here. 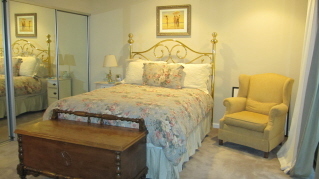 The condo has a king in the master suite and queens in both of the guest bedrooms. 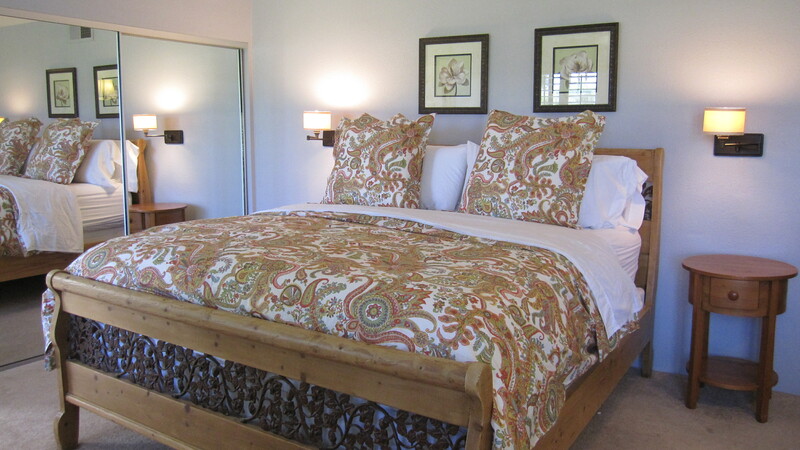 All three beds have fabric frames and headboards. None of the three beds had box springs! The mattresses where sitting directly on the frame slats and sunk down into the frames snuggly. The mattresses where great … new pillow tops of great depth, but practically sitting on the floor. Making a bed meant getting on your hands and knees … and to tuck in the comforter you inevitably scrapped your knuckles. For a short term guest … probably not a big deal. Who makes beds when they’re on vacation? For a three month guest living in a property, it’s a big problem. The guests also mentioned that the mattress covers would pop off during the night and sleeping with sheets and bedding coming apart was a struggle. Taking a closer look at the bedding, we discovered that the mattress cover was made of a plastic, waterproof material that was very slippery. This was compounded by silk sheets and silky comforters! There was so much going wrong here you had to laugh. The beds were absolutely gorgeous but when you pulled the comforter out from the tight frame to turn in for the night, the bedding slipped all over the place … taking on a life of its own! I shouldn’t laugh … the guests were not happy. I promised that I would speak to the owners and see if we could get the problem remedied as quickly as possible. Once explained, the owners completely understood and I was enlisted to make the necessary purchases …. Three sets of box springs, all new mattress covers and two new sets of sheets per bed … 100% cotton! The beds are fabulous. They now look and act as beds should. The four inch box springs lifted the mattress just level with the tops of the bed frames, increasing the height … but not so much that it takes away from the mid-century look. The cotton bedding is also easier to keep on while sleeping and the guests are no longer chasing their bed all night. So when furnishing your vacation home, it’s not only about beauty. A beautiful piece can also be functional. I always recommend that owners stay at their vacation home for a minimum of one week before their first paying guest. Sleep, cook, and entertain if you can … really live in the property. If something doesn’t work, change it immediately. It is better that you discover the problem rather than hearing about it in a bad review! Very often if a guest calls to report that something is broken or damaged … for example a toaster that burns the toast instead of popping up or a stained sheet, the vacation management company will deliver the newly purchased replacement and not retrieve the damaged item. So unfortunately these damaged items usually end up back in the kitchen cabinet or linen closet for the next guest to find. 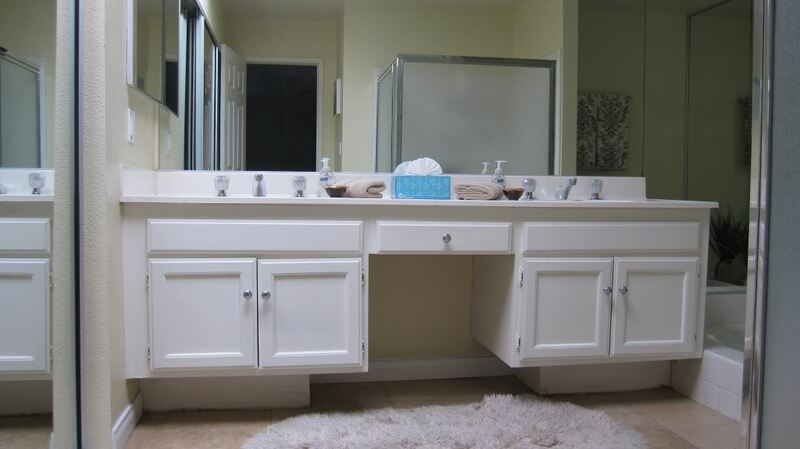 Over a period of time you have cabinets and cupboards full of damaged, unsightly and miss-matched items. The property I dressed up last week had eight fitted king sheets and six flat sheets. Most miss-matched, some worn, some torn and some just plain old outdated and ugly. A couple of sets were acceptable … and these were the ones that were currently being used. After purchasing two sets of sheets per bed, I tossed all the rest. 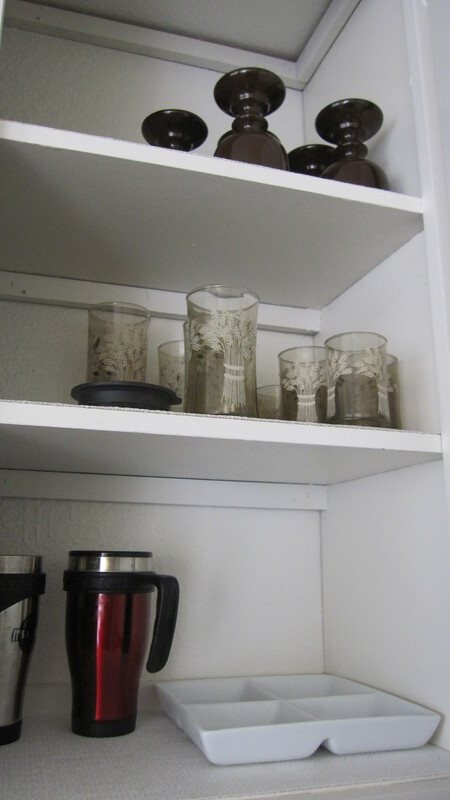 Similar in the kitchen … two partial sets of silverware, three sets of glass with no more than four of any set that matched. Because our property owners visit their properties on and off throughout the year, I have always left the inventory and replacement of supplies primarily in the owner’s hands, except where needed during occupancy. It has now become apparent that I will have to offer our assistance. A full inventory of your vacation home supplies is necessary each and every year. To do a thorough check takes hours and can be daunting … especially here in the desert where the interior temperature of a closed up property during our off season can run 100 degrees. This is what an inventory consists of: Remove all pots and pans and examine inside and out. Replace any with burns or scratched Teflon … ask yourself, “if this was not my pot, would I use it.” If not … replace. 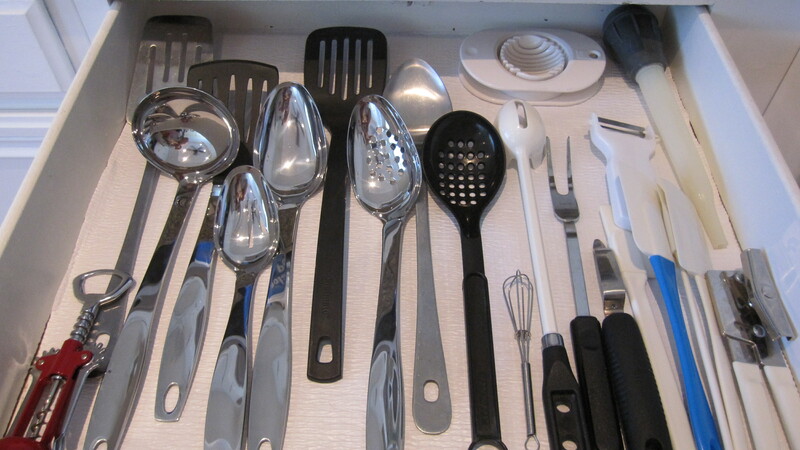 Count silverware and make sure you have complete matched settings of at least eight. If you have a larger property then you will have more place settings to consider. Regardless of the size of your property, less than eight place settings and your guests will have to run half loads in the dishwasher and probably after every meal. Remember … your guests are on vacation. Dishes should be counted and there should be no chips, crazing, cracks, knife marks and all should match. Seven dinner plates, eight bowls and six salad plates … not good. Visit HomeGoods and spend $40 on new dishes … then take the old ones to Good Will. Don’t leave them in the cabinet or you’ll end up with a hodge-podge mess. The same goes for utensils, serving ware, glasses and coffee mugs. You should not leave coffee stained mugs in the cabinet … and logo or novelty mugs are just tacky and appear to be “cheap” … unless, of course, they’re from Starbucks! Weed out the aluminum pie tins that people save and the plastic butter tubs, etc. It’s OK for your own home … not for a vacation property. Wood utensils are gross in a vacation rental and your tenants will probably not use them … would you? And please, please, please do not make your purchases at the 99 Cent Store! As tempting as it may be, you’ll lose repeat guests … people recognize quality. Towels, sheets, bedspreads, blankets, pillows, mattress pads … all should be perfect. No stains. Toss the old ones … there is no need to keep them even for rags. Rags after washed, always seem to end up back in the linen closet. The next guest will reach in for a clean towel and … surprise … minutes later you or your vacation rental manager are on the losing side of a phone call from an unhappy guest. Beds need to be stripped to check out mattress covers and flip the mattress to check for stains and damage. Hangers should be resupplied, batteries replaced in flashlights, smoke and carbon monoxide detectors and TV, electronics and ceiling fan remotes, fire extinguishers checked, brooms and mop-heads replaced, toilet brushes replaced. Everything, everything, everything check, check, check and double check. If you have an inventory list or minimum requirement list from your vacation management company, it will make this job much easier. Some companies require all bedding, linens, towels … replaced every year! I don’t think that is necessary, but looking at these items with a critical eye … or the eyes of your paying guests, is absolutely necessary every year. Some people hate to throw things away; it’s wasteful. I get it. If you feel this way … take the old items home and use them yourself or donate them to Good Will. Some people are frugal … but I cannot stress this enough … You! Have! Competition! Your neighbors would be happy to take care of your guests in the future. The vacation rental industry has become very, very competitive. There are plenty of property owners out there that “get it” and will provide newer, shinier homes with more amenities for less $$. It’s a business. People are not going to pay Saks Fifth Avenue prices at K-Mart. Gone are the days when people were just happy to get away on vacation. Vacation rental guests have high expectations and are not afraid to voice them … loudly. When you look at your rental income, you also have to look at “the cost of doing business” and if you have to spend a few hundred to make several thousand … that is part of the deal. Once you put the rental money in your pocket that is not where “the buck stops,” that’s just were it begins. Here’s a question for you … what if you were required to provide a complete inventory list to each of your vacation rental guests and the guests in return were asked to look over the list upon their arrival and report any missing or damage items. How would your property fair?